Tarte Rainforest of the Sea Seaglass Eyeshadow and Tarte Pro Remix Amazonian Palette swatches. So I had some free time at @thaisephora and so I did swatches of the Tarte Seaglass Eyeshadows and the Tarte Pro Remix Amazonian Palette. The shadows looked great from the bottle, and even looked greater once swatched. Scroll down to see which shade I got. Swatches of the Tarte Rainforest of the Sea Seaglass Eyeshadow in Shady Beach, Suite Life, Une Noche, Night Dive, Golden Hour, and Life’s a Beach. Here’s a more closeup photo. I tried the shade Una Noche. I dabbed it with the wand and used my fingers to blend it on my lids. It dries down completely and does not smudge at all, and there was no glitter fallout either! I was super impressed! I only used a small amount, and the outcome was a lighter version than my arm swatch, and it is super easy to wear. I think these are one of the best liquid eyeshadows I’ve tried. After leaving Sephora, I went to do my brows, and the brow lady asked me what eyeshadow I was wearing! She loved it so much! I’m thinking I might need to get somme during the next sale. We managed to bottle up the beauty of seaglass – this ultra-metallic & lustrous liquid-to-powder formula with an easy-to-use doe foot applicator delivers an intense splash of color & a wave of compliments. Below are photos I took of the tube and the wand of each shade. Tarte Rainforest of the Sea Seaglass Eyeshadow in shade Life’s a Beach. And the shade I got is Life’s a Beach! So here are photos taken in sunlight. And here are swatches in sunlight. It is just so pretty! See the shiftyness? Next, the Tarte Pro Remix Amazonian Palette. 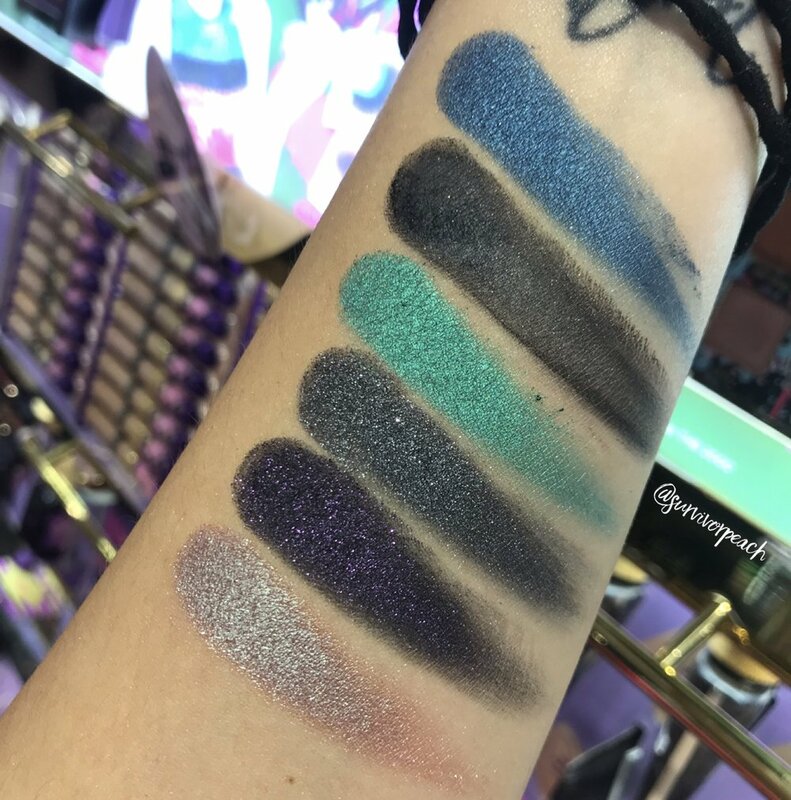 I do not own this, so I swatches it at Sephora. The colours are also really pretty and fun!They are shifty as well, which I love! Here’s what Tarte says about this palette: Prepare for an expression explosion! We’re passionate about pigment & this sequel to our OG pro palette came to play. This rich, vibrant 20-shade superstar was formulated to celebrate all forms of art & expression – it’s ready to rock your world & remix yourself. 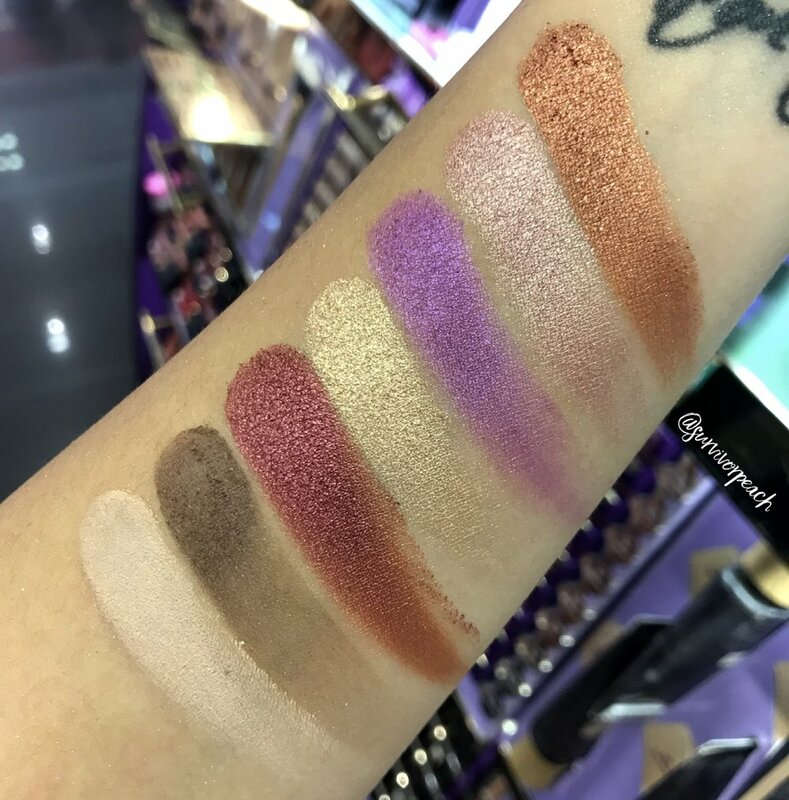 Below are swatches I did at Sephora. These are in bad lighting, but you can still see how pretty they are! I have no doubt these will look so beautiful in natural light. And the last set. DO YOU SEE THAT BOTTOM SHIFTY SHADE? Oh my god I can literally buy this whole palette just for that one shade! ( I did not though, because I convinced myself I have enough eyeshadows). I also have reviews of more of the Pro Remix items coming soon. Stay tuned!